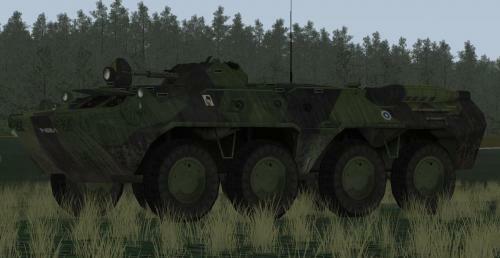 Finnish summer and winter camo with markings for the BTR-80. During the late 1980s and early 1990s the Finnish Defence Forces were testing APCs to equip more Jaeger units with. The BTR-80 too was tested, though the more expensive Finnish XA-180 won the contest, probably because Soviet Union went under... This skin is based on one of the test vehicles. But the Finns did use another BTR variant, the BTR-60PB from 1970s onwards all the way to 2007. This skin is good for that use too, as the differences in BTRs 60PB and 80 are not that big, especially in terms of SB (same armament etc.). The BTR-60 was first used by the jaeger battalion(s) that would work with the T-54/55 tanks, and later when the tracked IFVs took over, they were handed to light infantry units, like the XA-180 Pasi.